LONDON (AP) — British officials are hoping that the impending royal birth will produce a bouncing baby buoy for the economy. With the Duchess of Cambridge due to give birth to an heir to the throne next month, it's time for citizens and groups to consider how to best mark the moment. Happy occasions often boost consumer confidence, sparking a spring in the step that leads right to the shopping mall for street party snacks, summer frocks and suntan lotion. And happy national occasions with the royal family and a new heir hit an emotional jackpot in Britain — boosting national pride along with tea, cakes and commemorative china. "Royal fever is more intense now, actually," said Pauline Maclaran, a professor of marketing and consumer research at Royal Holloway and the co-author of "Tiaras, Tea Towels and Tourism: Consuming the British Royal Family," which will be published by the University of California Press. "At a time of crisis, when there is financial depression, people look for something to lift themselves." Britain really could use some consumer confidence right now. The economy is so flat no one has any idea how to pick it up. It grew last quarter at the less-than-stunning rate of 0.3 percent. But trend watchers say the royal birth is being seen as the country's latest installment of "Big Events." First, in April 2011, there was the royal wedding of Prince William and Kate Middleton, an extravaganza of horse-drawn carriages, breast-plated soldiers and white lace gowns. Then came the June 2012 Jubilee flotilla down the River Thames — a procession of some 1,000 highly decorated boats, all honoring Queen Elizabeth II's 60 years on the throne. Within months, London hosted the 2012 Summer Olympics, kicking it off with a flag-waving, torch-lit procession celebrating every scenic bit of this island nation, from Land's End in the west to the Scottish village of John o'Groats in the north. The mood was extended another month by the most watched, most-celebrated Paralympics in history. A study issued earlier this month by UK Trade & Investment suggested the 2012 "Summer of Sport," delivered 2.5 billion pounds ($3.9 billion) in foreign direct investment resulting from business events launched during the games. More comprehensive numbers on the games are expected later. Richard Cope, director of trends at the global market research firm Mintel, says the possibilities abound for using the royal birth to economic advantage. "These kinds of events do raise sense people's sense of pride," Cope said. "It makes them enjoy being British." And they make people all over the world curious about kings and queens and castles. The Tower of London, Hampton Court Palace and other royal-related tourist attractions bring in more than 500 million pounds ($765 million) a year from overseas tourists, and predictions are for a 3 percent increase this year after all the hoo-ha of 2012. VisitBritain estimates that culture and heritage — which include theaters, galleries, castles, stately homes and pubs — generates 4.6 billion pounds a year in total spending by overseas tourists. And while a royal birth isn't a typical economic event, things have a way of morphing in the social media age. The royals have come a long way since 1948, when Prince Charles' birth was announced by a footman who tacked a note to the railing outside Buckingham Palace. William's engagement was announced on Twitter and on the monarchy website — which allows the royals to speak directly to the public. Between direct access and media excess, just about anything that touches the Windsors gets a maximum amount of attention. The royals are marketplace movers in a way that goes way beyond commemorative china. When the Duchess of Cambridge wore a sapphire blue wrap dress to announce her engagement, designer Daniella Helayel found herself swamped with international attention — and buyers — within minutes. But it didn't end there. Style bloggers now hunt down what the duchess is wearing with astonishing speed. The demure black dress with a white Peter Pan collar from Topshop that she wore for a charity appeal cost 42 pounds ($65) and was available to anyone with a speedy modem. Ditto her coats, shoes and bags. Kate has made a point of choosing brands that are both accessible and British — and retail experts expect that trend to continue with her royal offspring. New moms and dads will want not only the baby Windsor's onesie, but also the baby carriage, the rattle and the teddy bear —followed by the royal tricycle, the scooter and on. Maclaran says it's not so much as a royal baby bounce but a steady drive toward the cash register that just keeps going as the little one grows up. "And they're bound to have more!" she said with glee. The royals have also done marketers a favor by exhibiting extreme tolerance in allowing the public to create stuff in their image. Unlike the International Olympic Committee, which guards its trademark interlocked rings with formidable force, Windsor Inc. pretty much lets the people poke fun at them. The royal wedding, for example, spawned artist Lydia Keith's barf bags — an idea she carried over to the royal birth with a "Shake, Rattle & Rule" royal morning sickness sick bag, which comes in baby blue and soft pink. Allowing jokes — and laughing along — allows the public to bond with Britain's royal family, Maclaran said. "The irreverent thing is what makes us love them," she said. 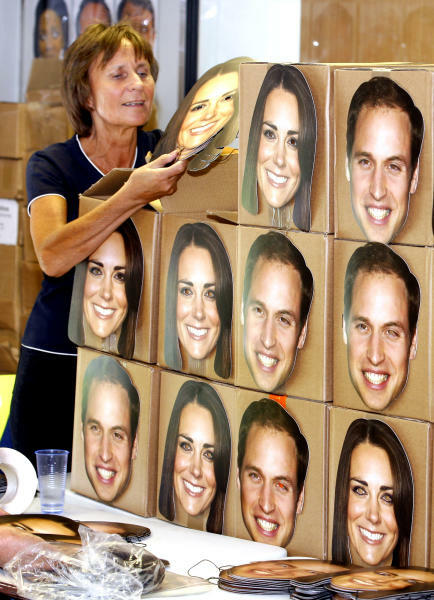 That's good for Ray Duffy, the managing director of Mask-arade, the Southam-based company that makes paper masks which are pictures of the royals with holes for the eyes. 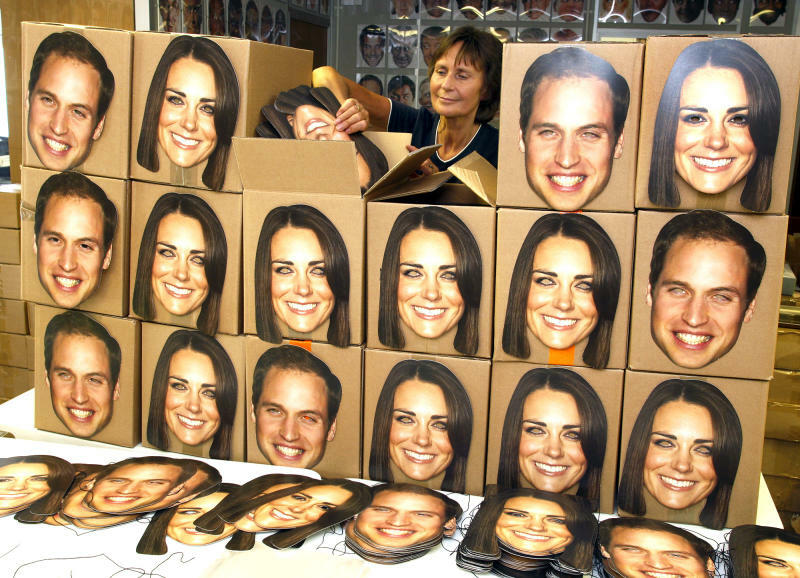 Duffy's on overdrive printing masks of Kate and William for the street parties that will follow the announcement of the royal birth. 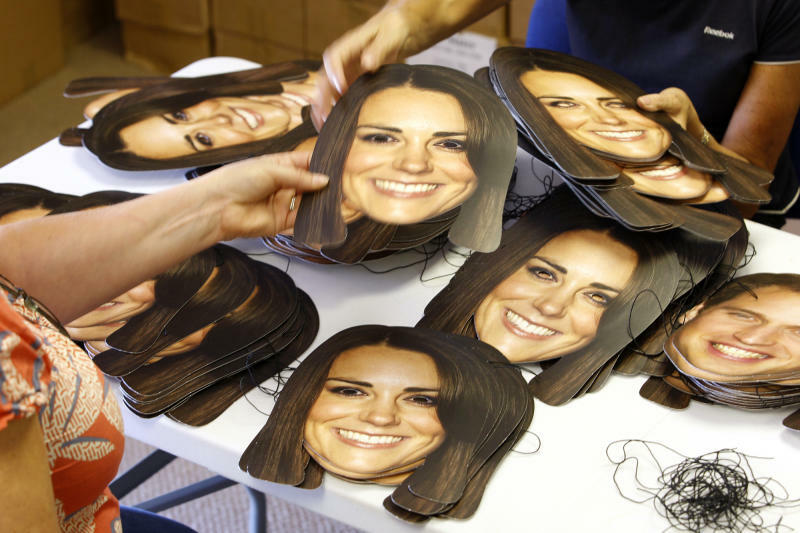 Normally, the company has 2,000 masks on hand but now they are whipping up 20,000 each of Kate and William. Historian Hugo Vickers stresses that — even if the royals are nicknamed "the "firm" in Britain — this is their blessed event and any economic boost is secondary. Charles is the current heir, and his son William is second-in-line. The new baby — boy or girl — will be third in line to the throne, bumping Prince Harry to number four. "It will focus the eyes of the world on Britain," Vickers said. "Everyone is excited by a baby. And everyone is really excited by a royal baby. And everyone is very, very excited when the baby is the heir to the throne."